I have a 60 day tourist visa which expires 9th December 2016 but need to extend this until end January. 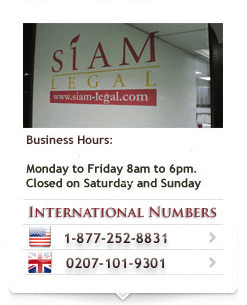 Can I extend my visa at the immigration office in Koh Samui? And if not, what options do I have? Thanks in advance. You may be able to apply for a visa extension at the immigration office in Koh Samui. Kindly get in touch with their office to confirm this. Otherwise, you may visit other immigration offices who provide this service. I have ED visa (single) and I will want to do extension. What documents is needed to extension in immigration office? Please get in touch with the immigration office where you will submit your application as they may differ depending on where you apply for the extension. Hi there. We will be looking to extend our 30-day visa exempt entry stamp at an immigration office in Bangkok as we do not have time to apply for a tourist visa in Denmark. Will it be possible to apply for an extension on the day of arrival? This would save us from going back to Bangkok or to Phuket half way through our holiday. Yes, you may already apply for an extension upon entry. You may visit the Chaengwattana Immigration office in Bangkok to apply. I have a multiple entry 6 months tourist visa which expires on the 13th of December. I would like to extend for 60 days at immigration. My question is my current 60 day stamp expires on the 20th of November. Do I need to do a border run and leave Thailand or can apply now at immigration in Samui for the 60 day extension without leaving the country? You can only extend your current 60-day stamp for 30 days at the immigration office. If you want to get your last 60-day stamp, you will need to exit and re-enter. Then, once you return, you can apply for a 30-day extension at the immigration office. We cross the border from Myanmar to Thailand with Israeli visa. How can we extend the visa? You may visit one of the immigration offices in Thailand to apply for an extension of your entry stamp which you receive upon arrival. I am a Nepali student doing my internship at Mai khao Lak. I have non-ed visa and it will expire on December 29, 2016. So, is it possible to extend my visa at the “Office of the Immigration Bureau, Phuket” or do I have to go to Nepal embassy at Bangkok? You may visit the Immigration Office in Phuket to apply for an extension of your ED visa. Please get in touch with their office to inquire about the requirements you will need for the application. Can we get a visa extension of 7 days on the airport itself where we get the visa stamp of 15 days on our passport? Since we need to show them our return ticket it will be easy to book the return ticket once for all and not change the date or modify the date of departure. The visa on arrival cannot be extended and airport immigration does not issue visa extension. Hi my 30-day extension expires on 12 of January 2017 and I need 30 days extra rather than fly out and back again. I will be close to the Laos border. Can I cross and go to the Thai embassy in Savanakhet and extend for 30 days and still come back by land or will that only entitle me to 15 days? If you are UK, Canada or US citizen, a quick border trip will be enough. You will be given 30 days at the border. I have a 30 day visa which I would like to extend to 60 days. I didn’t realize this might be possible before. I will be in Chiang Mai area from Monday. Is there somewhere I can do it up there? Thanks! Yes, you can do it in Chiang Mai Promenade Mall. The fee is 1900 baht. I have extended my tourist visa here in Nakonsawan for 30 days last November 28 which will expire on December 28, 2016. I may ask if I can do it after the expiration again while waiting for my documents. Thanks. You need to leave the country after the extension. You can re-enter Thailand and you will be given 30 days at the airport.